From the day we decided to make this trip to the US, the Grand Canyon was a top priority for me. I’ve heard about this run for a couple of years, and now it was my time to do it. After about a week in Flagstaff, we drove north towards the campsite on the south rim of the Grand Canyon. On May 17th, Ingvild had her go at the Canyon, running from the rim to the river and back up again. 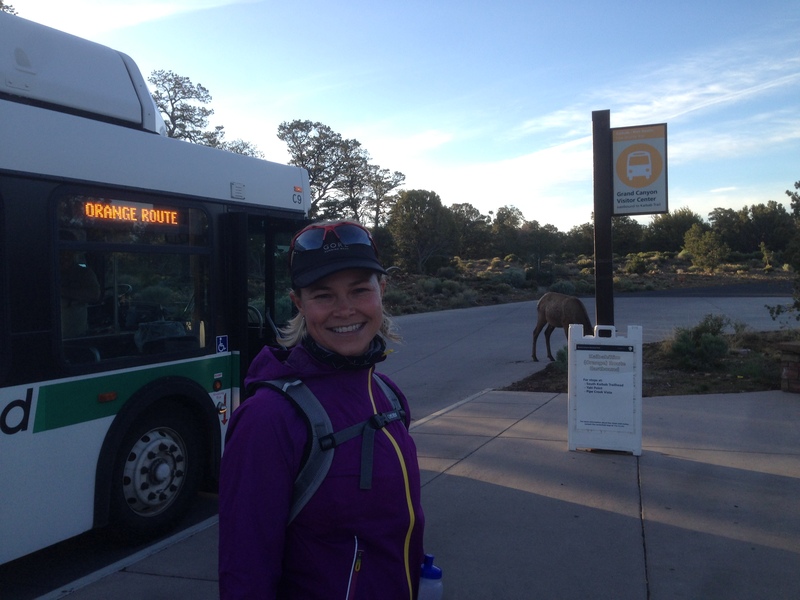 She reported that the trails were very nice, and that it wasn’t that hot down in the canyon. At 4.45 on May 18th it was my turn. I started with a small head torch since it was pitch black the first fourty minutes. 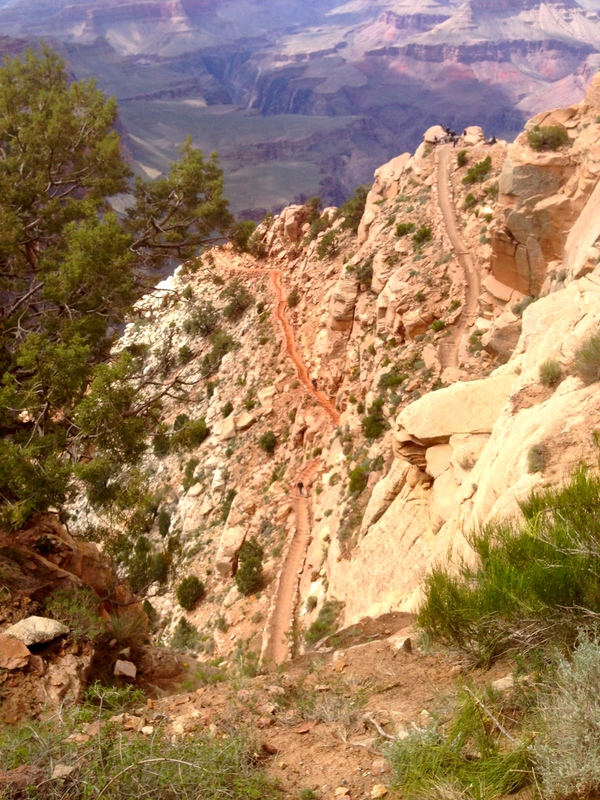 The trail down from the South Kaibab trailhead is just amazing! Technical for sure, but also very runnable.The nature and the views is impossible to describe. You have to come and see for yourself. I reached the river in less than an hour. 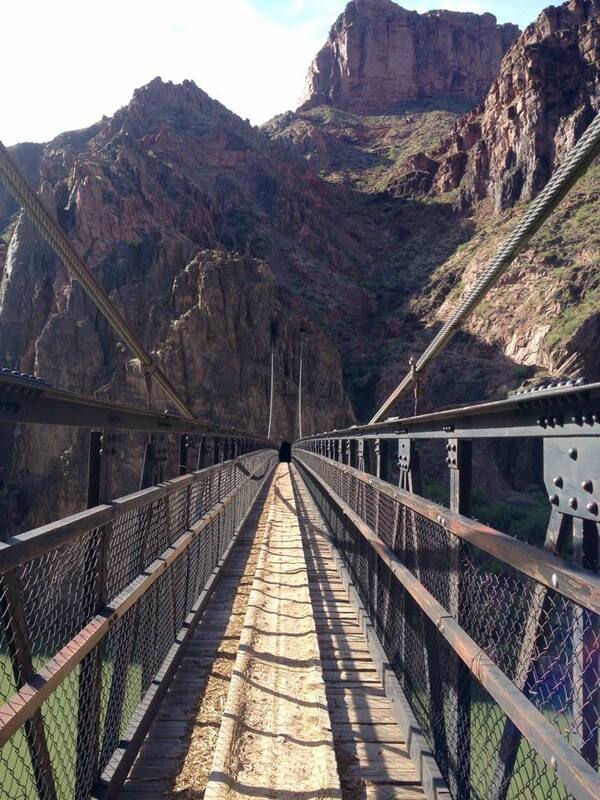 After crossing the bridge across the Colorado river, I started the long, gradual climb towards the north rim. The trail is flat in the beginning, but after ten kilometers or so, the gradient kicks in. 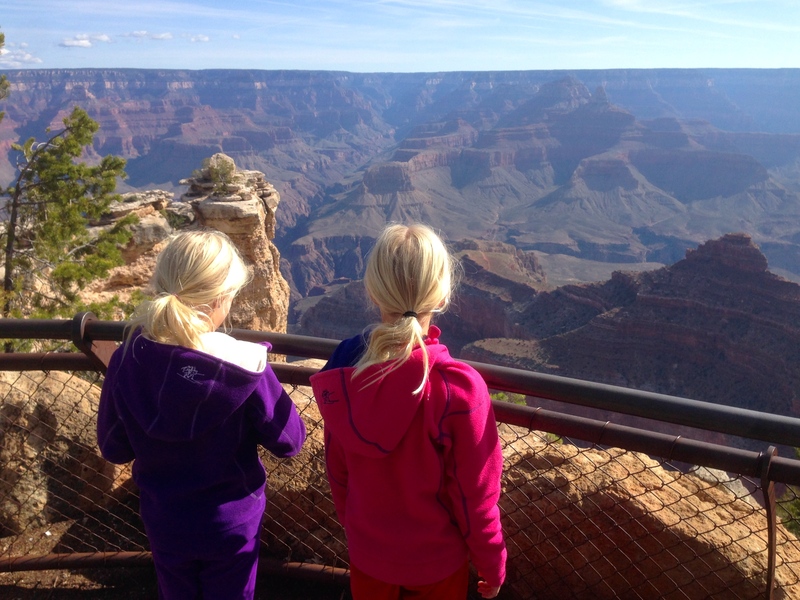 The north rim is actually higher than the south rim (2.100 meters vs. 2.400 meters). I turned around at the north rim after three and a half hours. On the way down again, I had to stop for two mule trains and a helicopter doing some kind of maintenance on the trail. It was also a little bit frustrating that I had to pass quite a lot of hikers on my way back to the river again. I thought there wouldn’t be many hikers in the canyon on a Monday, but I was wrong 🙂 No big deal – I politely asked if I could pass them, and 99 percent of those that I met moved to the right and let me pass. After I had crossed the river for the second time, I started the climb back up to south rim again. I guess Rob Krar and guys like him can run this uphill, but I have to admit that I hiked quite a few of the steepest sections. The climb up took me an hour and a half of hiking/running. Just over noon, I finally reached the South Kaibab trailhead again, and I had made it across the Grand Canyon and back again. If You ever get the chance to run in the Grand Canyon: just go! It is just incredible. Period. The bridge across the Colorado river. Duration: The run across the canyon and back took me about 7,5 hours (down and up from South Kaibab trailhead).The altitude gain is 3.100 meters. I am not sure about the exact distance of the run, my Garmin logged 72km. Nutrition: Tailwind nutrition in a bottle from Simple Hydration in addition to five or so gels. I brought Tailwind in small ziplock bags. It is fairly easy to get water. 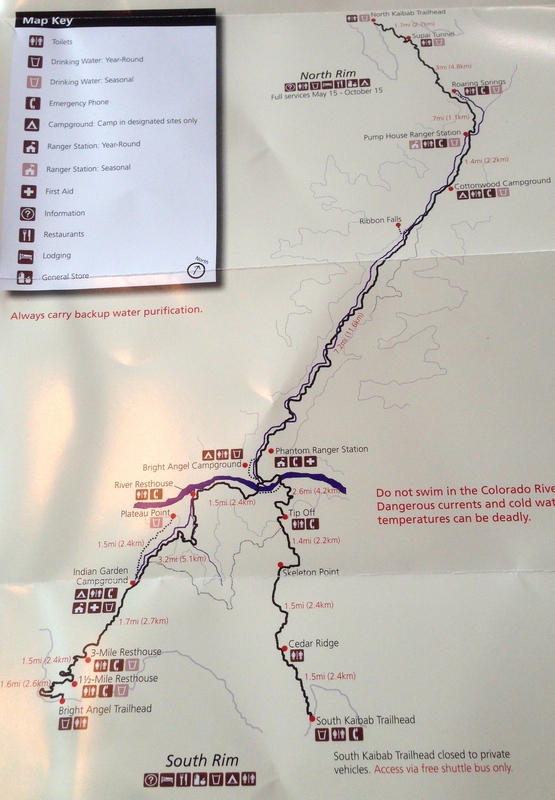 I refilled my bottle at the Phantom Ranger Station, Cottonwood campsite and at the north rim. Gear: Altra Lone Peak 2.5 shoes. Shorts, T-shirt, arm sleeves and underwear from Gore Running Wear. Injinji socks. Garmin 920XT. Salomon Ultra race vest. Weather: It wasn’t hot! Maybe 20 degrees celsius down at the river. I even had some rain and cold winds on my hike back up to the south rim. I think this is pretty extraordinary, so be careful if you plan your own attempt of the Grand Canyon. The view down from the South Kaibab Trailhead. Ingvild is ready for her run. Do you see the «wild» deer in the background? The views are just incredible! My route from the South Kaibab Trailhead to the North Rim and back again. With the right gear and the right nutrition, the R2R2R is a walk in the park 🙂 Thanks to Gore Running Wear, Altra Running, Simple Hydration, Garmin and Simple Hydration for making my life easy! 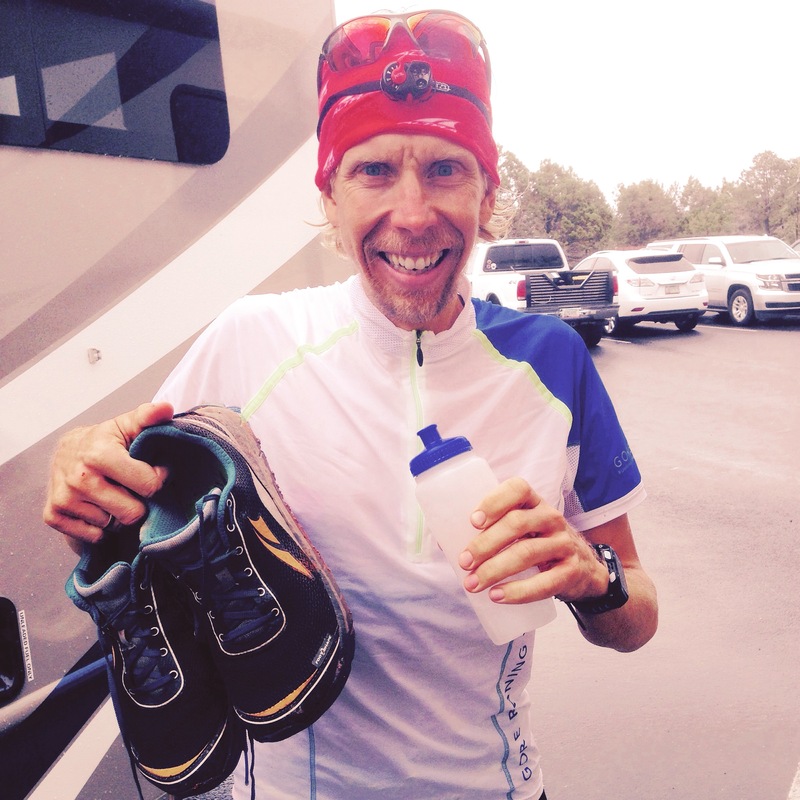 ← Better Ultra with Altra?